It is always a pleasure to make a trip to Caltech. Fortunately, the weekly seminar sponsored by the Caltech-JPL Association for Gravitational Wave Research (CaJAGWR) gives me a good reason to make a weekly pilgrimage. Today, I attended this week’s lecture featuring an overview of the research, developments and plans for Advanced Virgo, a device that will become part of the second generation gravitational wave detector network that includes the U.S. based Advance LIGO. Raffaele Flaminio, the speaker for the seminar, thoroughly went over the technical facets of Virgo+ (an incremental step) and AdVirgo – seismic isolation of test masses, increased laser power to 125W, the use of fused silica to suspend the test masses, larger 42kg mirrors for thermal noise reduction, and much more. It is amazing to me how the experimentalist continue to devise new techniques in laser optics to measure gravitational wave strain on spacetime down to a distance of one-thousandth the size of a proton. The current Virgo detector has now reached its design sensitivity and is contributing to the international network of GW detectors. In order to increase the detection probability to the point where several tens of events per year are expected, and upgrade of the detector is planned to be implemented by 2014 for the first science run (Virgo+ will be ready by mid-2011). Virgo has achieved a record of 6 straight days of “lock” which is considered a feat all onto itself. 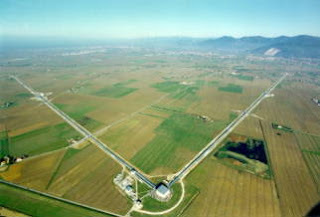 Virgo is sponsored by a European consortium called EGO (European Gravitational Observatory) and is located near Pisa, Italy (see inset picture). Gravitational wave astrophysics is this Physics Groupie’s number one focus, so keeping abreast of Virgo is fun, fun, fun.